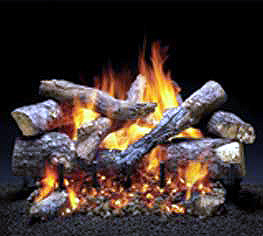 The Fireside Grand Oak log set has received the 2005 Vesta Award for Best Gas log set. With 11 realistic logs moulded from real oak timber (12 logs for the 30" size) and modern tiered burner system, your Fireside Grand Oak log set will create a multi-level active fire. The controls for your log set are hidden, yet easily accessible and do not interfere with the realism of your fire presentation. Use the form below to request more information on Fireside Grand Oak Gas Logs, and a Kastle sales rep will get back to you as soon as possible. Fields in red are required.